Discover Aquallure Antioxidant Rescue Cream, the luxurious moisturizer. Aquallure features a combination of hydrating ingredients, antioxidants and peptides, intended to keep your skin plump and healthy. All of the ingredients in Aquallure are intended to work together to help refresh, hydrate, and protect your skin. Aquallure may help reduce the appearance of fine lines and wrinkles, while revitalizing, smoothing and protecting skin. Discover Aquallure Antioxidant Rescue Cream, the luxurious moisturizer. Aquallure features a combination of hydrating ingredients, antioxidants and peptides, intended to keep your skin plump and healthy. Hyaluronic Acid is said to carry 1000 times its weight in water, meaning it may help your skin stay well-hydrated throughout the entire day. These three ingredients are well-known in skincare circles, believed to be effective moisturizers. Portobello Mushrooms don’t only taste good, the extract from these mushrooms provides powerful antioxidants. Beta Glycan, which is also extracted from Portobello Mushrooms, is believed to repair and renew skin. Alpha Lipoic Acid is known for being an antioxidant. It also believed to help soften fine lines. Palmitoyl Pentapeptide is said to help reduce the appearance of fine lines and wrinkles. Similar to Palmitoyl Pentapeptide, Palmitoyl Oligopeptide may also promote smooth skin. All of the ingredients in Aquallure are intended to work together to help refresh, hydrate, and protect your skin. 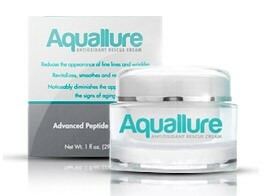 Aquallure may help reduce the appearance of fine lines and wrinkles, while revitalizing, smoothing and protecting skin.